Are you new to bowling or are you a seasoned bowler looking for ways to improve your game? Check out these bowling books for tips and tricks to start scoring over 200 pins per game. Michelle Mullen is an international published author and writer. She has published many books on bowling, this one having been her most renown publication. Ever since childhood, Mullen has had a passion for bowling. She competed at every level, high school and collegiate included. She has been a coach of the sport for nearly thirty years, and has no sign of slowing down. 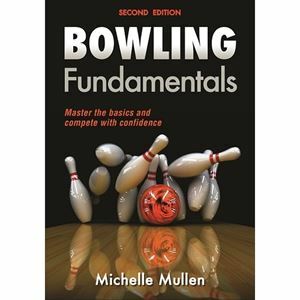 Michelle’s book, “Bowling Fundamentals” consists of tactical tips that can be used for anyone of any age group who is trying to get into the sport. When reading through this edition of Michelle’s book, you will learn proper foot-work technique, proper arm swinging technique, and positioning. You will also be given advice on how to keep your focus while playing the game, and tips on how to maintain your awareness. This book contains no fluff and/or padding, it goes straight to the heart of the material, that is important for your success on the lanes. Mullen does not make you suffer through pages of irrelevant text. She provides a useful guide that can be mocked as a one-on-one learning style. It covers everything you need to know about bowling. You wont be disappointed!! This book is ideal for a bowler of any skill level. Throughout the course of this book you will be taught to perfect a hook shot and also how to achieve incredibly high scores. You will discover the secret of the bowling form, you will learn new techniques, and you will be given a great overview of the sport and its history. After reading this book, you can greatly improve your bowling average, and will proudly be able to show off your new skills to your family and friends. Also, very importantly, you are guaranteed to learn its basic rules of play. Bowling is a very complex sport, but using this book, you will find it to be much simpler. What is great about Bowling For Dummies is that everyone loves the humor that is involved. Humor that will keep it from being a serious textbook. Humor that will want you to keep reading, and keep learning new bowling ways. I would very much recommend this book as a gift. Any family member or friend would be pleased to receive this. It is a very fun way of learning, and is very easy to follow. Go buy it now!! This book was written for the more experienced bowler. The author does a great job in keeping his teaching simple. With the added techniques that he mentions in the book, it is very probable that anyone will increase their numbers, let alone reach 200. This is considered to be the bible of bowling… Many professional bowlers have taken tips, and skills from this book, and have noticed drastic differences in their bowling game. It covers the basic fundamentals of your bowling approach, and teaches advanced wrist positioning placements. You will not be disappointed when reading through the chapters of this book. Aulby does a great job of pacing his teaching, which ensures your complete understanding, and successfully attempted trials. This book is for any bowler who needs help with their bowling form. The book sold over 1000 copies within its first year of release, and has continued to reach new bowlers in the industry. Mike Aulby and Dave Ferraro do not disappoint in this instructional guide on how to bowl 200+. Ferraro is considered to be one of the fastest rising stars in the bowling industry. He has earned over one-hundred and fifty thousand dollars within one year of the PBA. I would highly recommend this book to any bowler who has great aspirations of success in this sport. John Jowdy’s latest masterpiece provides you with a great opportunity to refine your bowling techniques. Jowdy, a PBA Hall of Famer, was one of the best ever bowling coaches to lay foot into the industry. Unfortunately he passed away in 2013, but his legend, as one of the best bowlers to ever live, lives on. Through this book of his, you are certain to improve your bowling game by a great margin. He provides a great amount of detailed instruction, and a great amount of masterful bowling techniques. This is a very well written instruction book that provides you with tools to set up your shot, and play different lane conditions properly. People obsess over this book for multiple reasons. People have been noticing a great amount of consistency in their game after reading this book. People have been noticing increases in their bowling averages after reading this book. And best of all, people have been noticing more ease in their games after having followed Jowdy’s simple techniques. You truly will become a much better player, if you follow master Jowdy’s tips! Do you have another book in mind that is a great resource? Comment below and let us know!